Tempered safety glass has been designed for maximum protection of the display on your smartphone. Glass brand Qoltec is the perfect choice for those who appreciate quality. Thanks to the unique processes of our glasses are extremely hard (9H), while maintaining optimal clarity and transparency. Protect your phone from dirt, scratches, fingerprints and absorb every blow. Glass have rounded corners and edges, do not lose luster and do not reflect the sun, which ensures comfort. Thanks to the extremely thin glass display does not change the properties of touch. 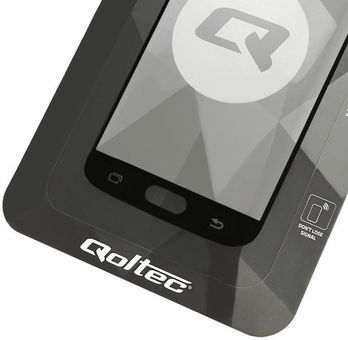 The kit includes glass by Qoltec perfectly fit to the size of the display. To prepare the display for mounting glass, to set added two wipes: wet to remove grease stains from the display and dry to wipe it from remained particles.